RadCalendar can be easily configured to show more than one month in the calendar area. To enable this functionality, simply set the MultiViewRows and MultiViewColumns properties to specify the number of month views to appear in each row and column. When using Multi-view mode, it is a good idea to use the CalendarTableStyle property to provide some separation between the individual calendar views. For more information on style properties, see Styles. 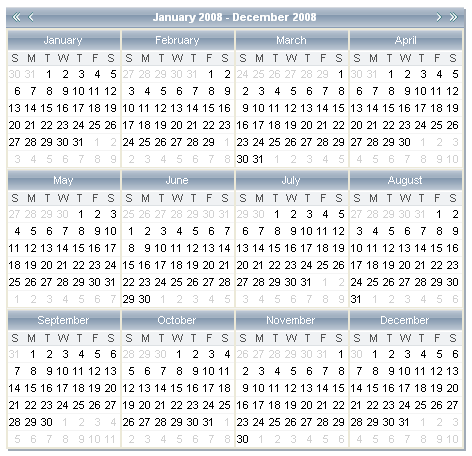 Multi-view calendar logic works -only- when AutoPostBack="true" . As a result, if a RadCalendar control is used as the popup control inside a RadDatePicker or RadDateTimePicker control, it cannot use multi-view mode.